Make staying fit and active easy with the Merax Magnetic Mini Exercise Bike, allowing for minimum effort and maximum results. Manufactured with a patented whisper silent magnetic operating system, experience smooth pedaling at 8 resistance levels ranging from light to heavy so you can adjust to your skill level and increase intensity as you get stronger over time. Two built-in pedals on either side are designed to accommodate both feet and hands featuring adjustable foot straps with non-slip foot surface and hand grips, allowing users to place the bike underneath their desk or table a casual leg workout or on top of a desk for an energizing arm workout. 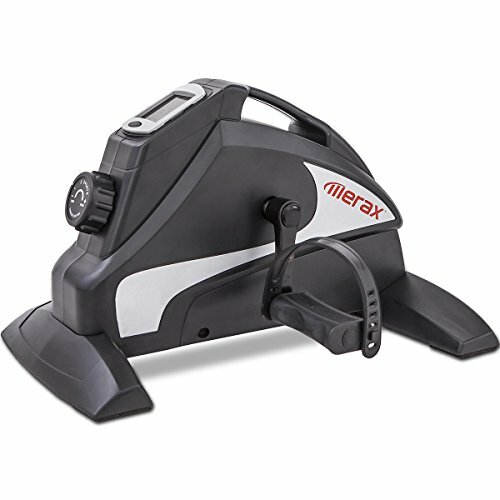 Get your regular dose of exercise in when doing casual activities you enjoy, like surfing the internet on your computer or watching TV on the couch - the low impact nature of the merax mini exercise bike also makes it an excellent choice for rehabilitation and physical therapy. Monitor your workout in real-time with the touch of a button on the large LCD display that features your time, speed, distance and calories burned to keep you motivated and challenging yourself so you can improve.